3. Click the “Save and display” button at the bottom of the page to complete the initial setup. Now that you’ve created the Forum, you need to add topics to which your students will respond. 3. 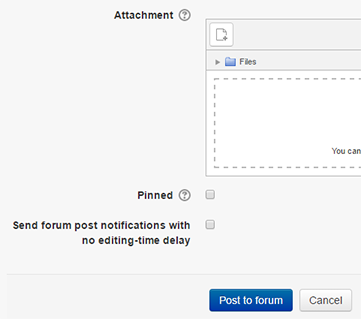 You also have options to include a file attachment to your posting. After at least adding a “Subject” and “Message”, be sure to click the “Post to forum” button.